Could Minster give Yamaha and Roland a run for their money in the digital piano market? For a studio or home piano with excellent sounds, touch, and USB capability at an excellent price, this is a serious contender. Impressive keyboard action, USB for controller keyboard capability, inbuilt effects. Position of USB/audio connection ports means the keyboard has to be used with its stand, some inbuilt sounds lack realism, too heavy for most live situations. Digital pianos appeal to a range of potential users. They make excellent practice instruments for those looking for realistic piano sounds, their headphone ports mean you can plug-in and tinkle the ivories without annoying your neighbours, and some models can be used as home and live keyboards. Yamaha Clavinovas and Roland's offerings are usually the go-to when considering buying a digital piano, but they are by no means the only players in this field. The Minster MPS-8H is a mid-priced digital piano whose specifications, at least on paper, suggest this instrument might prove a force to be reckoned with. 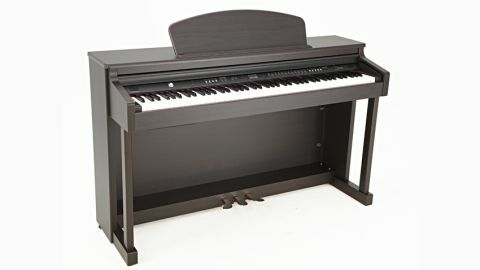 The piano arrives in two boxes, one containing the instrument and the other containing its stand, which itself houses the instrument's pedalboard. Both are well designed and built. Full assembly takes no more than 15 minutes, but you'll need a screwdriver and plenty of lifting power. Putting this piano together is a two-man job, which means it's not really an option as a home/live hybrid solution. The connections area, containing audio outputs, headphone port and the USB connector, is housed on the underside of the keyboard. This means that you have no choice but to use the stand - you can't use this keyboard on a tabletop. Once setup is complete and the keyboard cover is back, you're greeted by an attractive panel featuring silver buttons, many of which are circled with red LEDs when activated. The panel buttons are self explanatory, yet many offer an impressive level of depth. This is best demonstrated by the voice options. There are 12 instrument types, each with its own button that is located on the right of the panel. Each of these buttons offers five variations, giving a grand total of 60 native internal sounds. Additionally, a full set of general MIDI (GM) sounds are accessible for compatibility with other GM-enabled instruments. You're not limited to a single sound across the keyboard range, either, as twin and layer modes enable you to split the keyboard or to combine two voices across it, respectively. The keyboard also includes its own effects, organised into categories of chorus (with four variations), feedback, flanger, short delay and feedback delay. The separate reverb effect enables you to add spatial depth to the sound. The MPS-8H offers a pleasing keyboard action that will appeal to acoustic pianists. While dedicated piano students will always benefit from playing a 'real' instrument, there are huge benefits to digital equivalents, as typified by the range of features available here. With a collection of good quality in-built sounds, USB connectivity, which enables the keyboard to 'talk' directly to computer-based recording setups, onboard effects and plenty more besides, this keyboard deserves your attention.